Caring for Garden Mums | Starkie Bros.
Mums are beautiful blooms that come in a wide range of bold tones and rich autumn hues, and savvy gardeners can keep mums healthy and flourishing for weeks in late fall with the proper care. Plant Early: If you plan to overwinter these perennials so they survive into spring, they should be planted as early as possible to allow the roots to become firmly established. 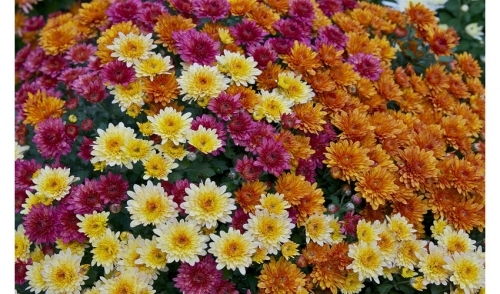 Mums are inexpensive enough to treat as annuals, however, if desired. Position for Full Sun: Mums do best in full sunlight (6-8 hours of sunlight per day or more). If they do not get enough sun, the plants will become taller and leggy, with fewer blooms to enjoy. Plant in Well-Drained Soil: These flowers require well-drained, organically rich soil. In areas with less than ideal soil, prep the top 8-12 inches of soil with compost to improve its quality and provide sufficient organic material for healthy mums. Provide Air Circulation: Mums need adequate air to stay disease-free. Small plants should be planted 8-12 inches apart, while larger, more mature plants can be planted so they are just touching. Mums will need to be divided every 2-3 years to keep them a healthy size. Water Thoroughly: Mums do not tolerate dry conditions well, and should not be allowed to wilt. Check the plants daily or every other day for signs of dryness, and give them an inch of water each week. Soaking the foliage can create pest or disease problems, so dripper or soaker hoses are best for watering garden mums. Fertilize Appropriately: If the mums are just used in containers and will be discarded in winter, fertilizing is not necessary. For perennial mums, adjust fertilizers seasonally, and use a high-phosphorus fertilizer in fall to encourage greater root growth. Pinch Prudently: Pinching off new growth encourages mums to keep their compact size and shape and creates more blooms. Keep pinching them throughout spring and early summer for the best autumn display. Removing faded blooms in fall can also extend the bloom time. Mulch Heavily: After the first hard frost and the mums are done blooming for the year, trim them to within 3-4 inches of the ground and layer 4-6 inches of mulch over them, including working mulch around the stems. This will protect the plants for spring regrowth. With proper care, the luxurious colors and firm mounds of garden mums can be showstoppers in your flowerbeds year after year.